The United States relies on natural gas for over one-fourth (28 percent) of its energy needs. Natural gas is clean, convenient, and efficient, which makes it the country's most popular home heating fuel. Every day in the United States, several million cubic feet of natural gas travel through an underground pipeline delivery system to 70 million customers. The natural gas flows from deep inside the earth into producing wells and then into gathering pipelines. These smaller pipelines eventually feed into the large transmission pipes that crisscross the nation. Machines called compressors keep the gas moving through the transmission system at high pressures. After a journey of up to 700 miles per day, the natural gas arrives at the local utility's gate station. Some of the natural gas is stored underground for later use, the rest of the gas is sent by the utility through a network of smaller pipes to the home or business where it will be used. The normal pressure for natural gas traveling through a household's pipes is less than the pressure created by a child blowing bubbles through a straw in a glass of milk. 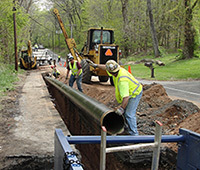 Safety incidents on natural gas pipelines are rare, but do occur. Excavation and other outside force damage, generally by third parties, represent the leading cause of incidents. Before you dig, call your local One Call Center. Safety is the number-one priority of America's natural gas industry. The pipeline infrastructure, which includes 1.5 million miles of natural gas pipeline, is the nation's safest energy delivery system, according to U.S. government statistics. Together, gas utility and pipeline companies invest billions annually to ensure that natural gas is delivered in a safe and reliable manner.